I interviewed Debby Gies about her memoirs written under the pen name D G Kaye, her book and travel blogs, and her work with online groups. 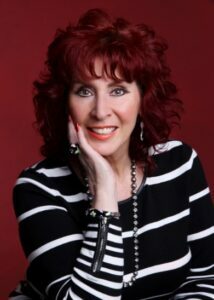 Debby, who is a prolific author and blogger, says about herself: ‘I’m a nonfiction memoir writer who writes about life, matters of the heart and women’s issues. My intent is to inspire others by sharing my stories about events I encountered, and the lessons that come along with them. Leslie: What were the childhood experiences that spurred you on to become a non-fiction writer? Debby: When I was a young child, I became intently aware of my home environment living in the chaos of my parents’ turbulent relationship, resulting in my mother throwing my father out of our home for her own selfish reasons. Of course, I didn’t realize this until I became a young teen. I was ever fearful of my mother’s temper and learned early in life not to ask questions about why my father couldn’t live with us, questions she didn’t feel were my business. My burning questions and curiosity led me to writing my own summations from what I observed and letters to my mother, expressing my feelings about our family situation, which I never gave her but helped lessen the burden in my heart to release on to paper. My note-taking continued through my life with my observances and opinions. I was always so desperate to learn the truth and the whys, and I suppose those beginnings kept me writing my truth right into eventually sharing my stories and observations in my books. Leslie: What life experiences have you adapted into each of your books? If there’s an ‘angle’ in each, what is it please? 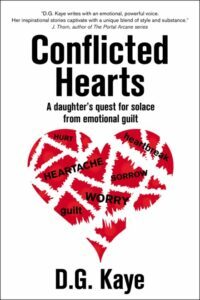 Debby: In my memoirs Conflicted Hearts and P.S. 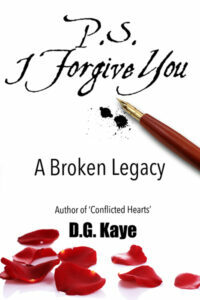 I Forgive You, I write about my life growing up with a narcissistic mother and how it affected me from childhood right through to adulthood. My stories evoke a view from a child’s perspective caught in the middle of her parents’ relationship and how her reign carried through into my adulthood. In my book Words We Carry, I talk about how I overcame my lack of self-esteem. 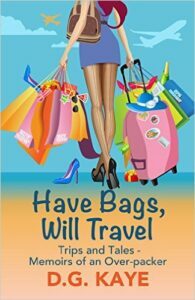 Have Bags, Will Travel is a short travelogue of places I’ve visited and things I learned along the way through my travel experiences and some humorous events that occurred along the way. My Menowhat? A Memoir, was written after my hellish journey through menopause where I talk about how this passage can be life changing mentally and physically, adding some anecdotes and words of wisdom for others to take in, all the while trying to keep it light with a touch of humor. 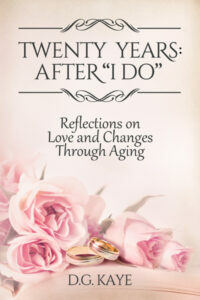 My latest book – Twenty Years: After “I Do”, is a memoir of my life being married to a man 21 years my senior and how to keep a good marriage going strong despite the pitfalls of circumstance. Leslie: You review other people’s books. Can you describe, please, what’s distinctive about your online book reviews? Debby: I think every book reviewer has their own style unique to how they feel about a book. My reviews are not tomes, yet, I believe they focus on the ‘meat’ of the stories and how those stories left me feeling. Every reviewer is different. Some like to recap a whole book, and others choose to dissect a book down to every typo or grammatical error. If I enjoyed a book, I like to share my opinion about it, hoping that somebody else may too enjoy it. I have a personal motto that I don’t review books that aren’t worthy of 4 and 5 stars. If I start reading a book that I find is in serious need of good editing, too much head hopping that has me having to go back a page every time to figure out who the author is talking about, I’ll usually stop reading the book. As an author myself who fears the dreaded crappy reviews, I can’t bring myself to give another author a bad review. On the same note I’d like to add that because all my reviews are 4 and 5 stars, that in no way indicates I rated the book so to appease an author. To repeat, I’ll only write a review for books deserving of those ratings. Leslie: What kind of ideas/experience do you aim to get across when writing the travel column for Sally Cronin’s Smorgasbord blog? Debby: I love to travel and am grateful to have had the chance to travel a lot in my life. I love to share my stories, and often I’ve found my friends get a charge out of hearing about some of my outlandish experiences on some of my travels. I also wrote my little travelogue – Have Bags, Will Travel for that reason. I was fortunate to be invited to write a monthly column at Sally’s blog because of my passion for travel. So far, all the places I’ve written about there are places I’ve actually been to, where besides writing about a little history on each place, I can write my opinion on my observances and recommend features I discovered about each place from my own experience. Leslie: Can you tell us about your role as an administrator of the Authors/Bloggers Rainbow Support Club – and your work with Colleen Cheesebro and Marjorie Mallon on that and other sites. Debby: Colleen, Marjorie and myself came up with the idea to open the ABRSC Facebook group to create a place where authors and bloggers could share their work and intermingle with other writers. But the group is more than just a place for writers to share their work and news about their books, it’s a place for writers to post articles and information they’ve come across that would be helpful to other writers as well as a place where writers can pose questions about dilemmas they may be encountering in their writing or with self-publishing and get answers from other writers who have encountered these issues and offer answers – hence the name ‘support group’. I am a big sharer of information and of the work of others so often my posts may hog the page, lol. I also do most of the vetting for accepting new members as I like to think of myself as an eagle eye when it comes to sniffing out ‘real people’ or fake accounts on the internet. Colleen and I also run The Literary Diva’s Library Facebook group, which I’m happy has also gained a good following and growing. That group is more geared toward sharing book reviews, not just for our own books, but reviews for other books we’ve read. Members are encouraged to post reviews of books they too have enjoyed to give a book and its author some promotion. Leslie: As a blogger, what else do you write about that you haven’t mentioned so far? Debby: I’m an eclectic mix of thought and that’s what you’ll usually get on my blog. I like to limit my posts to three times a week on average as I feel that way I’m not chained to my blog and I don’t overwhelm my readers with too many posts. On my blog I have my Sunday Book Reviews where I share a review of a book I recently read. On Tuesdays I usually share a post of something I’ve written myself. That can range from a memoir byte – a story relating to my writing, a rant – where I tell of a recent experience I witnessed or encountered where I found injustice, or sharing news about a recent event. Often, I’ll reblog an interview or feature I recently wrote for at someone else’s blog. Fridays used to be reserved for my author guest interviews, which somehow got lost in the shuffle this past year, but I will be resuming next March, with a little restructuring. For now, I like to share contest news, reblog something from another writer that I feel is pertinent to my readers, or feature a post on writing tips where I share links I’ve accumulated through the week which I feel will be helpful for other writers. I am also part of the ‘We are the World Blogfest’ team – #WATWB where writers participate the last Friday of every month in sharing something good that’s going on in the world to deflect some of the negativity we so often hear on the news. And lastly, I also run another blog with my Seven Sisters of the Fey, where we take turns writing on all things magical and mystical from fairies to horoscopes and tarots, to numerology and crystals, and angels and intuition are my specialty. Leslie: What’s behind the names you use as a writer, Debby Gies and D.G. Kaye, and your Twitter handle @pokercubster? Debby: Well, as far as my pen name goes, I tried to keep it close to my real name, Debby Gies. The initials are self- explanatory – my first and last name, and I created my last name from shortening my maiden name which began with the letter ‘K’. I couldn’t very well pen myself as D.G.K. so I expanded the initial ‘K’ into the last name Kaye. Crafty eh? Lol. As for my Twitter handle, oyez, that was an accident that remained. I used to be a tournament poker player before I began writing books. I created a Twitter handle a few years before I became a published author, when my social circles were more geared toward poker players. As a first-time author who hadn’t yet learned the value of social media, I never really gave my handle a second thought – I had one already so why not just keep it? The ‘poker’ part explains the sport and ‘cubster’ was my online name for the various online sites I played on. Before it really dawned on me that I’d be stuck with that name I had already amassed a good following and was afraid I’d lose a lot of followers if I changed it. So, @pokercubster it remains! Thank you so much, Leslie, for inviting me over today to share some of myself here today. I know I enjoy reading about other authors and how they go about their life and writing, so I hope your readers enjoyed my visit here today too. Next week, Jackie Thomas talks about her handmade books that tell complex stories about science in pictures. Always something new to find out about Debby Gies and as always informative and entertaining. I certainly have enjoyed the last four years of being part of her community and love having her as part of my blog on a regular basis. A great friend to many and we are lucky to know her.. thanks Leslie.. Sorry about that, Debby. Your comments seem to be coming through now. It’s great to see Debby here. Thanks for having such great guests, Leslie. So glad to have you this week on my website, Debby. Thank you! Good interview about Deb. I’m always intrigued by her poker background! BTW, I love how you shared her books throughout the post. I may borrow that. I always enjoying reading interviews Debby has done. I may have read some of her answers before, but she tells her answers in a way that keeps me transfixed as if she’s sat across the table from me while we both drink coffee. She’s a very dear friend who goes out of her way to encourage and support other writers and bloggers. I’d be lost without her. Thank you for your interesting interview of Debby. I am fascinated by most people and what makes them tick. I knew of her love of travel, but not of her poker playing… and was sad to learn of Debby’s unhappy childhood, as I had a happy one. I feel she has earned her sense of fun and humour in her maturity. Best wishes. That’s exactly what I thought about Debby. Thank you, Joy! This is a wonderful interview, Debby! I love learning more about my fellow writers and their origin stories. It sounds like you have a lot of projects going! Thank you, Leslie, for sharing this! And thank you, Julie, for such a positive comment! Thank you, Leslie, for interviewing my sister in Fey, Debby. She is a constant support to others and a fantastic listener. Her writing is a source of understanding and draws you into her world while highlighting things which have happened in your world. I think she underestimates the influence she has and how good her writing is. Love you sis. It’s always good to get to know our friends a little better. You asked Debby insightful questions which prompted interesting responses, Leslie. Thanks for posting this interview. Great to learn more about Debby. She is a woman of many talents! Thanks for interviewing Debby, Leslie. Every time I read something about or from Debby, I learn something new. Anyone who “tells it like it is” and has no qualms about sharing her opinions, is a woman close to my heart. Yes, Debby’s prolific! I enjoyed interviewing her.